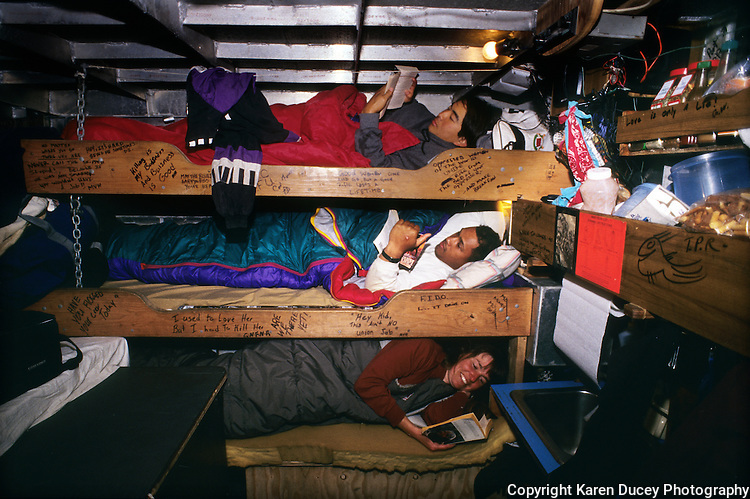 The F/V Little Comfort from top to bottom: Kevin Imai, ken Larson and Karen Ducey sleep in their bunks, or racks, during the Bristol bay sockeye salmon fishery in July 1994. Bristol Bay is home to the world's largest sockeye salmon fishery. The commercial salmon drift gillnet fishing fleet is limited to boats no longer than 32 feet in length. There were over 1,800 permanent entry permits listed in 2002 which each vessel is required to have. Typically boats fish with two or three deckhands. Peak of the season is around July 4th in this fishery which lasts about a month. The rivers also get a fair amount of chum, king, and chinook salmon. Bristol Bay is located in the southwest part of Alaska. This fishery is managed by "the Alaska Department of Fish and Game" and is a sustainable fishery. Until around the year 2000, fishing on the Egegik North Line was lively and lucrative..